World of Warcraft Tribute joins the Tribute series of art books from Udon. It's a fan art book with artworks collected from fans over the world during Udon's call for submission. The book comes in two edition, a limited hardcover and a standard paperback. Both are 224 pages. 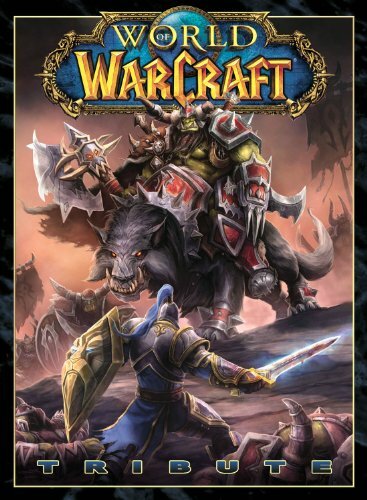 The hardcover has a dust jacket that features art from Arnold Tsang while the standard edition cover art is from Samwise Didier, art director of Blizzard Entertainment. The limited hardcover edition debuted at San Diego Comic Con 2013. The only other place to get it would be at Udon Store online but they haven't listed it yet. I will update again when they do. The standard edition will be released in September 2013. The binding looks good enough for a book this thick. Over hundreds of artists are featured. Each has their artwork given the full page treatment. Official Warcraft art have their own art style and direction so it's refreshing to see the fan's take on the characters with their own styles and interpretation. The art is great, of course. Even though they are fan art, the quality is high. In addition to the mainly fantasy art style, there are also comic, anime, cartoony and other illustrative style. There's even a Mucha style piece with the decorative background, not the type of setting you would associate with Warcraft that's for sure. There's also a brief gallery from Udon artists. It's a wonderful fan art compilation. Recommended to all who like Warcraft, fantasy, concept and video game art. Definitely also check out other Tribute art books and The Art of Blizzard Entertainment. Limited hardcover edition should be available at Udon Store online soon.